Die from a STM32F100C4T6B IC. 24 MHz ARM Cortex-M3 microcontroller with 16 KB flash memory, 4 KB RAM. Manufactured by STMicroelectronics. The ARM Cortex-M is a group of 32-bit RISC ARM processor cores licensed by Arm Holdings. They are intended for microcontroller use, and have been shipped in tens of billions of devices. The cores consist of the Cortex-M0, Cortex-M0+, Cortex-M1, Cortex-M3, Cortex-M4, Cortex-M7, Cortex-M23, Cortex-M33, Cortex-M35P. The Cortex-M4 / M7 / M33 / M35P cores have an FPU silicon option, and when included in the silicon these cores are known as "Cortex-Mx with FPU" or "Cortex-MxF", where 'x' is the core number. The ARM Cortex-M family are ARM microprocessor cores which are designed for use in microcontrollers, ASICs, ASSPs, FPGAs, and SoCs. Cortex-M cores are commonly used as dedicated microcontroller chips, but also are "hidden" inside of SoC chips as power management controllers, I/O controllers, system controllers, touch screen controllers, smart battery controllers, and sensors controllers. Though 8-bit microcontrollers were very popular in the past, Cortex-M has slowly been chipping away at the 8-bit market as the prices of low-end Cortex-M chips have moved downward. Cortex-M have become a popular replacements for 8-bit chips in applications that benefit from 32-bit math operations, and replacing older legacy ARM cores such as ARM7 and ARM9. Arm Holdings neither manufactures nor sells CPU devices based on its own designs, but rather licenses the processor architecture to interested parties. Arm offers a variety of licensing terms, varying in cost and deliverables. To all licensees, Arm provides an integratable hardware description of the ARM core, as well as complete software development toolset and the right to sell manufactured silicon containing the ARM CPU. Integrated device manufacturers (IDM) receive the ARM Processor IP as synthesizable RTL (written in Verilog). In this form, they have the ability to perform architectural level optimizations and extensions. This allows the manufacturer to achieve custom design goals, such as higher clock speed, very low power consumption, instruction set extensions (including floating point), optimizations for size, debug support, etc. To determine which components have been included in a particular ARM CPU chip, consult the manufacturer datasheet and related documentation. SysTick timer: A 24-bit system timer that extends the functionality of both the processor and the Nested Vectored Interrupt Controller (NVIC). When present, it also provides an additional configurable priority SysTick interrupt. Though the SysTick timer is optional, it is very rare to find a Cortex-M microcontroller without it. If a Cortex-M33 microcontroller has the Security Extension option, then it has two SysTicks, one Secure and one Non-secure. Bit-Band: Maps a complete word of memory onto a single bit in the bit-band region. For example, writing to an alias word will set or clear the corresponding bit in the bit-band region. This allows every individual bit in the bit-band region to be directly accessible from a word-aligned address. In particular, individual bits can be set, cleared, or toggled from C/C++ without performing a read-modify-write sequence of instructions. Though the bit-band is optional, it is less common to find a Cortex-M3 and Cortex-M4 microcontroller without it. Some Cortex-M0 and Cortex-M0+ microcontrollers have bit-band. Memory Protection Unit (MPU): Provides support for protecting regions of memory through enforcing privilege and access rules. It supports up to eight different regions, each of which can be split into a further eight equal-size sub-regions. Tightly-Coupled Memory (TCM): Low-latency RAM that is used to hold critical routines, data, stacks. Other than cache, it is typically the fastest RAM in the microcontroller. Note: Most Cortex-M3 and M4 chips have bit-band and MPU. The bit-band option can be added to the M0/M0+ using the Cortex-M System Design Kit. Note: Software should validate the existence of a feature before attempting to use it. Note: Limited public information is available for the Cortex-M35P until its Technical Reference Manual is released in 2019. Data endianness: Little-endian or big-endian. Unlike legacy ARM cores, the Cortex-M is permanently fixed in silicon as one of these choices. Interrupts: 1 to 32 (M0/M0+/M1), 1 to 240 (M3/M4/M7/M23), 1 to 480 (M33/M35P). Vector Table Offset Register: Optional. (not available for M0). Instruction fetch width: 16-bit only, or mostly 32-bit. Single-cycle I/O port: Optional. (M0+/M23). Number of watchpoint comparators: 0 to 2 (M0/M0+/M1), 0 to 4 (M3/M4/M7/M23/M33/M35P). Number of breakpoint comparators: 0 to 4 (M0/M0+/M1/M23), 0 to 8 (M3/M4/M7/M33/M35P). The Cortex-M0 / M0+ / M1 implement the ARMv6-M architecture, the Cortex-M3 implements the ARMv7-M architecture, and the Cortex-M4 / Cortex-M7 implements the ARMv7E-M architecture. The architectures are binary instruction upward compatible from ARMv6-M to ARMv7-M to ARMv7E-M. Binary instructions available for the Cortex-M0 / Cortex-M0+ / Cortex-M1 can execute without modification on the Cortex-M3 / Cortex-M4 / Cortex-M7. Binary instructions available for the Cortex-M3 can execute without modification on the Cortex-M4 / Cortex-M7 / Cortex-M33 / Cortex-M35P. Only Thumb-1 and Thumb-2 instruction sets are supported in Cortex-M architectures; the legacy 32-bit ARM instruction set isn't supported. All six Cortex-M cores implement a common subset of instructions that consists of most Thumb-1, some Thumb-2, including a 32-bit result multiply. The Cortex-M0 / Cortex-M0+ / Cortex-M1 / Cortex-M23 were designed to create the smallest silicon die, thus having the fewest instructions of the Cortex-M family. The Cortex-M0 / M0+ / M1 include Thumb-1 instructions, except new instructions (CBZ, CBNZ, IT) which were added in ARMv7-M architecture. The Cortex-M0 / M0+ / M1 include a minor subset of Thumb-2 instructions (BL, DMB, DSB, ISB, MRS, MSR). The Cortex-M3 / M4 / M7 / M33 / M35P have all base Thumb-1 and Thumb-2 instructions. The Cortex-M3 adds three Thumb-1 instructions, all Thumb-2 instructions, hardware integer divide, and saturation arithmetic instructions. The Cortex-M4 adds DSP instructions and an optional single-precision floating-point unit (VFPv4-SP). The Cortex-M7 adds an optional double-precision FPU (VFPv5). The Cortex-M23 / M33 add TrustZone instructions. Note: The Cortex-M0 / M0+ / M1 doesn't include these 16-bit Thumb-1 instructions: CBZ, CBNZ, IT. Note: The Cortex-M0 / M0+ / M1 only include these 32-bit Thumb-2 instructions: BL, DMB, DSB, ISB, MRS, MSR. Note: The Cortex-M0 / M0+ / M1 / M23 only has 32-bit multiply instructions with a lower-32-bit result (32bit × 32bit = lower 32bit), where as the Cortex-M3 / M4 / M7 / M33 / M35P includes additional 32-bit multiply instructions with 64-bit results (32bit × 32bit = 64bit). The Cortex-M4 / M7 (optionally M33 / M35P) include DSP instructions for (16bit × 16bit = 32bit), (32bit × 16bit = upper 32bit), (32bit × 32bit = upper 32bit) multiplications. Note: The number of cycles to complete multiply and divide instructions vary across ARM Cortex-M core designs. Some cores have a silicon option for the choice of fast speed or small size (slow speed), so cores have the option of using less silicon with the downside of higher cycle count. An interrupt occurring during the execution of a divide instruction or slow-iterative multiply instruction will cause the processor to abandon the instruction, then restart it after the interrupt returns. Multiply instructions "32-bit result" – Cortex-M0/M0+/M23 is 1 or 32 cycle silicon option, Cortex-M1 is 3 or 33 cycle silicon option, Cortex-M3/M4/M7/M33/M35P is 1 cycle. Multiply instructions "64-bit result" – Cortex-M3 is 3–5 cycles (depending on values), Cortex-M4/M7/M33/M35P is 1 cycle. Divide instructions – Cortex-M3/M4 is 2–12 cycles (depending on values), Cortex-M7 is 3–20 cycles (depending on values), Cortex-M23 is 17 or 34 cycle option, Cortex-M33 is 2–11 cycles (depending on values), Cortex-M35P is TBD. Note: The Cortex-M4 / M7 / M33 / M35P has a silicon option choice of no FPU or single-precision (SP) FPU, and the Cortex-M7 adds a third silicon option of supporting both single-precision (SP) and double-precision (DP). If the Cortex-M4 / M7 / M33 / M35P has a FPU, then it is known as the Cortex-M4F / Cortex-M7F / Cortex-M33F / Cortex-M35PF. Note: The Cortex-M series includes three new 16-bit Thumb-1 instructions for sleep mode: SEV, WFE, WFI. Note: Interrupt latency cycle count assumes: 1) stack located in zero-wait state RAM, 2) another interrupt function not currently executing, 3) Security Extension option doesn't exist, because it adds additional cycles. The Cortex-M cores with a Harvard computer architecture have a shorter interrupt latency than Cortex-M cores with a Von Neumann computer architecture. Note: The single-precision (SP) FPU instructions are valid in the Cortex-M4 / M7 / M33 / M35P only when the SP FPU option exists in the silicon. Note: The double-precision (DP) FPU instructions are valid in the Cortex-M7 only when the DP FPU option exists in the silicon. The 32-bit ARM instruction set is not included in Cortex-M cores. Endianness is chosen at silicon implementation in Cortex-M cores. Legacy cores allowed "on-the-fly" changing of the data endian mode. Co-processor were not supported on Cortex-M cores, until the silicon option was reintroduced in "ARMv8-M Mainline" for ARM Cortex-M33/M35P cores. The SWP and SWPB (swap) ARM instructions don't have a similar feature in Cortex-M. The "BLX <immediate>" instruction doesn't exist because it was used to switch from Thumb-1 to ARM instruction set. The "BLX <register>" instruction is still available in the Cortex-M.
SETEND doesn't exist because on-the-fly switching of data endian mode is no longer supported. Co-processor instructions were not supported on Cortex-M cores, until the silicon option was reintroduced in "ARMv8-M Mainline" for ARM Cortex-M33/M35P cores. The SWI instruction was renamed to SVC, though the instruction binary coding is the same. However, the SVC handler code is different from the SWI handler code, because of changes to the exception models. The Cortex-M0 core is optimized for small silicon die size and use in the lowest price chips. Hardware integer multiply speed: 1 or 32 cycles. The Cortex-M0+ is an optimized superset of the Cortex-M0. The Cortex-M0+ has complete instruction set compatibility with the Cortex-M0 thus allowing the use of the same compiler and debug tools. The Cortex-M0+ pipeline was reduced from 3 to 2 stages, which lowers the power usage. In addition to debug features in the existing Cortex-M0, a silicon option can be added to the Cortex-M0+ called the Micro Trace Buffer (MTB) which provides a simple instruction trace buffer. The Cortex-M0+ also received Cortex-M3 and Cortex-M4 features, which can be added as silicon options, such as the memory protection unit (MPU) and the vector table relocation. The smallest ARM microcontrollers are of the Cortex-M0+ type (as of 2014, smallest at 1.6 mm by 2 mm is Kinetis KL03). On 21 June 2018, the "world's smallest computer'", or computer device was announced – based on the ARM Cortex-M0+ (and including RAM and wireless transmitters and receivers based on photovoltaics) – by University of Michigan researchers at the 2018 Symposia on VLSI Technology and Circuits with the paper "A 0.04mm3 16nW Wireless and Batteryless Sensor System with Integrated Cortex-M0+ Processor and Optical Communication for Cellular Temperature Measurement." The device is 1/10th the size of IBM's previously claimed world-record-sized computer from months back in March 2018, which is smaller than a grain of salt. The Cortex-M1 is an optimized core especially designed to be loaded into FPGA chips. Thumb-1 (most), missing CBZ, CBNZ, IT. Thumb-2 (some), only BL, DMB, DSB, ISB, MRS, MSR. 32-bit hardware integer multiply with 32-bit result. 1 to 32 interrupts, plus NMI. Hardware integer multiply speed: 3 or 33 cycles. Optional Tightly-Coupled Memory (TCM): 0 to 1 MB instruction-TCM, 0 to 1 MB data-TCM, each with optional ECC. External interrupts: 0, 1, 8, 16, 32. Data endianness: little-endian or BE-8 big-endian. OS extension: present or absent. 3-stage pipeline with branch speculation. 32-bit hardware integer multiply with 32-bit or 64-bit result, signed or unsigned, add or subtract after the multiply. 32-bit multiply is 1 cycle, but 64-bit multiply and MAC instructions require extra cycles. 32-bit hardware integer divide (2–12 cycles). 1 to 240 interrupts, plus NMI. Optional Memory Protection Unit (MPU): 0 or 8 regions. Conceptually the Cortex-M4 is a Cortex-M3 plus DSP instructions, and optional floating-point unit (FPU). A core with an FPU is known as Cortex-M4F. 32-bit hardware integer multiply with 32-bit or 64-bit result, signed or unsigned, add or subtract after the multiply. 32-bit Multiply and MAC are 1 cycle. DSP extension: Single cycle 16/32-bit MAC, single cycle dual 16-bit MAC, 8/16-bit SIMD arithmetic. Optional floating-point unit (FPU): single-precision only IEEE-754 compliant. It is called the FPv4-SP extension. The Cortex-M7 is a high-performance core with almost double the power efficiency of the older Cortex-M4. It features a 6-stage superscalar pipeline with branch prediction and an optional floating-point unit capable of single-precision and optionally double-precision operations. The instruction and data buses have been enlarged to 64-bit wide over the previous 32-bit buses. If a core contains an FPU, it is known as a Cortex-M7F, otherwise it is a Cortex-M7. 6-stage pipeline with branch speculation. Longest of all ARM Cortex-M cores. Optional floating-point unit (FPU): (single precision) or (single and double-precision), both IEEE-754-2008 compliant. It is called the FPv5 extension. Optional CPU cache: 0 to 64 KB instruction-cache, 0 to 64 KB data-cache, each with optional ECC. Optional Tightly-Coupled Memory (TCM): 0 to 16 MB instruction-TCM, 0 to 16 MB data-TCM, each with optional ECC. Optional Memory Protection Unit (MPU): 8 or 16 regions. Optional Embedded Trace Macrocell (ETM): instruction-only, or instruction and data. Optional Retention Mode (with Arm Power Management Kit) for Sleep Modes. The Cortex-M23 core was announced in October 2016 and based on the newer ARMv8-M architecture that was previously announced in November 2015. Conceptually the Cortex-M23 is similar to a Cortex-M0+ plus integer divide instructions and TrustZone security features, and also has a 2-stage instruction pipeline. Hardware integer divide speed: 17 or 34 cycles maximum. Depending on divisor, instruction may complete in fewer cycles. Optional Memory Protection Unit (MPU): 0, 4, 8, 12, 16 regions. Optional Security Attribution Unit (SAU): 0, 4, 8 regions. Single-cycle I/O port (available in M0+/M23). Micro Trace Buffer (MTB) (available in M0+/M23/M33/M35P). Nuvoton M2351 (announced, not yet generally available). The Cortex-M33 core was announced in October 2016 and based on the newer ARMv8-M architecture that was previously announced in November 2015. Conceptually the Cortex-M33 is similar to a cross of Cortex-M4 and Cortex-M23, and also has a 3-stage instruction pipeline. Optional Floating-Point Unit (FPU): single-precision only IEEE-754 compliant. It is called the FPv5 extension. The Cortex-M35P core was announced in May 2018. It is conceptually a Cortex-M33 core with a new instruction cache, plus new tamper-resistant hardware concepts borrowed from the ARM SecurCore family, and configurable parity and ECC features. Limited public information is currently available for the Cortex-M35P until its Technical Reference Manual is released in 2019. As of October 2018, no chips have been announced. 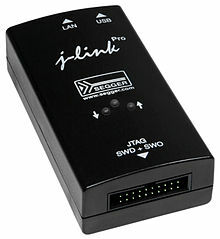 Segger J-Link PRO. Debug probe with SWD or JTAG interface to target ARM chip, and USB or Ethernet interfaces to host computer. The documentation for all ARM chips is extensive, especially for newcomers. The documentation for microcontrollers from past decades would easily be inclusive in a single document, but as chips have evolved so has the documentation grown. The total documentation for all ARM chips consists of documents from the IC manufacturer and documents from CPU core vendor (Arm Holdings). IC manufacturers have additional documents, such as: evaluation board user manuals, application notes, getting started guides, software library documents, errata, and more. See External links section for links to official Arm documents. ^ a b c d Cortex-M0 r0p0 Technical Reference Manual; Arm Holdings. ^ a b c d e Cortex-M0+ r0p0 Technical Reference Manual; Arm Holdings. ^ a b c d Cortex-M1 r1p0 Technical Reference Manual; Arm Holdings. ^ a b c d Cortex-M3 r2p1 Technical Reference Manual; Arm Holdings. ^ a b c d Cortex-M4 r0p1 Technical Reference Manual; Arm Holdings. ^ a b c d Cortex-M7 r0p2 Technical Reference Manual; Arm Holdings. ^ a b c d Cortex-M23 r1p0 Technical Reference Manual; Arm Holdings. ^ a b c d e f g h i j k l m n o p q r ARMv6-M Architecture Reference Manual; Arm Holdings. ^ a b c d e f g h i j k l m n o p q r ARMv7-M Architecture Reference Manual; Arm Holdings. ^ a b c d Cortex-M3 Embedded Software Development; App Note 179; Arm Holdings. ^ a b c Cortex-M33 r0p3 Technical Reference Manual; Arm Holdings. ^ a b c Cortex-M System Design Kit; Arm Holdings. ^ a b c d e ARMv8-M Architecture Reference Manual; Arm Holdings. ^ Fingas, Jon (25 February 2014). 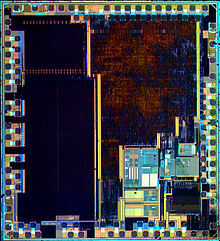 "Freescale makes the world's smallest ARM controller chip even tinier". Retrieved 2 October 2014. ^ Sadasivan, Shyam. "An Introduction to the ARM Cortex-M3 Processor" (PDF). Arm Holdings. Archived from the original (PDF) on July 26, 2014. ^ "The Samsung Exynos 7420 Deep Dive - Inside A Modern 14nm SoC". AnandTech. Retrieved 2015-06-15. ^ "Cortex-M7 Processor". Arm Holdings. Retrieved 2014-09-24. ^ "ARM Supercharges MCU Market with High Performance Cortex-M7 Processor". arm.com (Press release). September 24, 2014. ^ "KV5x: Kinetis KV5x - 240 MHz, ARM® Cortex®-M7, Real-Time Control, Ethernet, Motor Control and Power Conversion, High-Performance Microcontrollers (MCUs)". Freescale Semiconductor. Archived from the original on 2015-04-15. Retrieved 2015-04-09. ^ "i.MX RT Series: MCU/Applications Crossover Processor | Arm® Cortex®-M7 |NXP". www.nxp.com. Retrieved 2018-07-16. ^ a b c d New ARM Cortex-M processors offer the next industry standard for secure IoT; Arm Holdings; October 25, 2016. 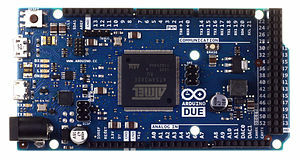 ^ a b ARMv8-M Architecture Simplifies Security for Smart Embedded Devices; Arm Holdings; November 10, 2015. ^ "Cortex-M35P Processor". Arm Holdings. Retrieved 2018-06-04. Embedded Systems with ARM Cortex-M Microcontrollers in Assembly Language and C; 3rd Ed; Yifeng Zhu; 738 pages; 2017; ISBN 978-0982692660. Designer's Guide to the Cortex-M Processor Family; 2nd Ed; Trevor Martin; 490 pages; 2016; ISBN 978-0081006290. ARM Assembly for Embedded Applications; 3rd Ed; Daniel Lewis; 318 pages; 2017; ISBN 978-1543908046. Definitive Guide to the ARM Cortex-M0 and Cortex-M0+ Processors; 2nd Ed; Joseph Yiu; 784 pages; 2015; ISBN 978-0128032770. Definitive Guide to the ARM Cortex-M3 and Cortex-M4 Processors; 3rd Ed; Joseph Yiu; 600 pages; 2013; ISBN 978-0124080829. Digital Signal Processing and Applications Using the ARM Cortex-M4; 1st Ed; Donald Reay; 250 pages; 2014; ISBN 978-1118859049. Embedded Systems: Introduction to ARM Cortex-M Microcontrollers; 5th Ed; Jonathan Valvano; 506 pages; 2012; ISBN 978-1477508992. Assembly Language Programming: ARM Cortex-M3; 1st Ed; Vincent Mahout; 256 pages; 2012; ISBN 978-1848213296. Wikimedia Commons has media related to ARM Cortex-M.
Opcodes: Thumb-1 (1, 2), ARM (3, 4), GNU Assembler Directives (5). This page was last edited on 14 March 2019, at 23:58 (UTC).